The sky was blue as we drove the few kilometres from Mount Hotham (J B Plain camping area), where we spent a night down to Diamantina Hut on the Great Alpine Road, the starting point for our walk to Feathertop. On the way down we could see the long ridgeline of The Razorback extending out towards the distant peak of Feathertop. It was the holidays - a lot of cars were parked at Diamantina Hut when we arrived, so parked ours on the side of the road and headed to the mountain! 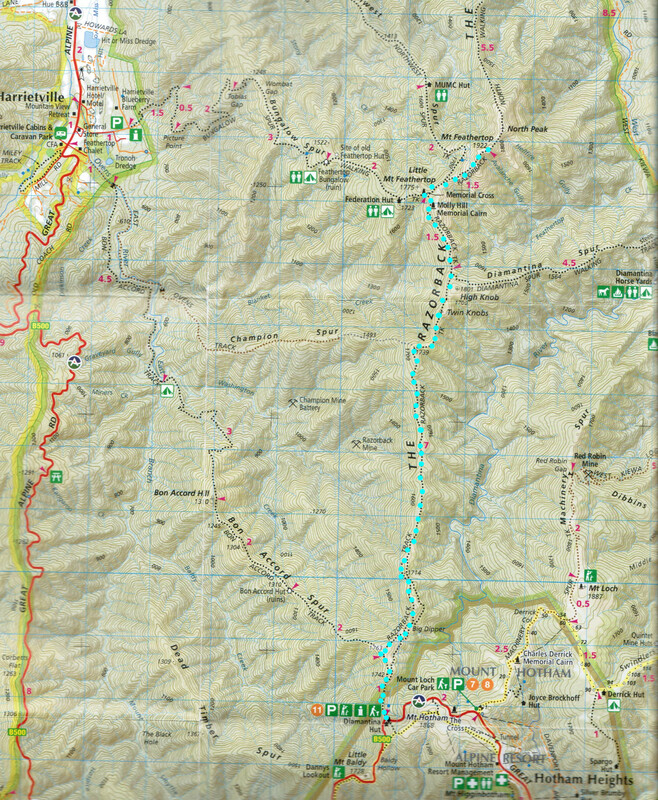 Rangers notes say: “The Razorback Walking Track (22km) begins at Diamantina Hut, 2.5 km on the Harrietville side of the Hotham Village. It crosses the high ridge linking Mt Hotham and Mt Feathertop (1922m). The junction with the Bungalow Spur Track is 1.5 km from the summit at a site called The Cross. The final climb to the top is steep but well worth the effort. It is recommended to return by the same route or, if you have made suitable transport arrangements, walk down to Harrietville via the Bungalow Spur Tack”. The track is generally an easy track, wandering along the slopes. The open grassy verges of the track were speckled with the yellow, orange, pink and white flowers. After a long and pleasant stroll through these open herb-fields, we entered an area of erstwhile snow-gum forest - the starkly white dead trunks surrounded by thickets of new growth as the trees recovered from the fires. The edge was a good spot for a sit in the shade of new-growth thicket and enjoy the expansive views through the trees. Prompted by the march flies, we set off again to commence a series of short steep climbs and descents as we crossed a rugged and narrow section of the ridge known as Twin Knobs. From Twin Knobs we went along the western slope of the ridgeline, looking out at Federation Hut. Soon we arrived at the base of Little Feathertop, where a large unburnt snowgum at the junction of our track and the route leading down past Federation Hut to the Bungalow Spur gave us a shady spot to take on a bit of energy for the climb up the mountain. The steep-sided slopes of Feathertop lay ahead to the northwest, its summit only 1.5km away. Getting into a steady climbing rhythm, we pushed on up the steep and rocky track through a grassy flower-speckled alpine meadow to cross the false peak and reach the summit of Victoria's second highest mountain. From its 1922 m summit, we had a 360° panorama - east across the wide Kiewa Valley to the flat tops of the Bogong High Plain, south back along the long ridgeline of The Razorback that we had just crossed, westward across the long green valley of Harrietville to Mount Buffalo and northward to an unending series of fading blue ridgelines - magnificent. It was time to descend and retrace our steps along The Razorback. Strange how the track had been lengthened by the heat on the return journey. It was hot, we drunk all the water and everyone was tired of getting rid of flies. The flies were flying around, sitting on our backpacks and they were so annoying! Anyway, after couple of hours of walking under the sun, we saw a Diamantia Hut, and then our car. Everyone was so tired when we finally got back to the road, that we couldn’t walk any further. We drunk most of our water sitting in the shade (!) and ate most of our fruits. After an hour of-doing-nothing, we all agreed that it had been an exhilarating introduction to the Victorian high country. Thanks to Boris and Lena for sharing this walk with us.